One For The Evening Gloria! 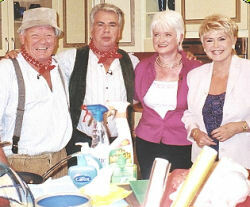 Paul Gunningham went along to see how TV presenter Gloria Hunniford would cope with The Wurzels as guests! Never having been to a TV studio before, I wasn't sure what to expect when I arrived at Pearson TV's studios in London for the recording of Open House With Gloria Hunniford. The reason I went? Because Gloria's guests were The Wurzels! They were there to promote the forthcoming Combine Harvester 2001 "Cowshed" Remix single, and I was keen to see them and meet up with them again - I had been asked to come along early, partly because Pearson wanted to borrow a picture of Adge Cutler to show during the interview, and partly so I could join the small band of people who were privileged to be invited to watch the recording of the music, which for technical reasons was to be pre-recorded separately before the main programme. I had been asked to turn up at around 5:30pm, but they were running late and I was taken upstairs by Greg, the programme's researcher, to my own private dressing room! Not that I had anything to change into, mind - but I guess they had to put me somewhere. 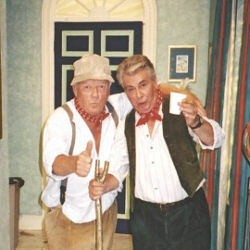 As I followed Greg along the corridor, I began to feel a little bit like a star myself (by association, as it were) as I noticed the names on the other doors - among them "Gloria Hunniford", "Alice Beer" (it turned out she was another guest on the show) and finally "The Wurzels"! For the next twenty minutes or so I was left to my own devices and plied with sandwiches and coffee by Gabby, who was responsible for the welfare of the audience. When she returned I think she felt a bit sorry for me being stuck in my "prison cell" and took me back downstairs, just in time for the arrival of the other "early" guests, including farmer Tim Gibson who had made the trip all the way down from North Yorkshire for the occasion - that's true dedication to the cause! We were ushered upstairs to a reception room for coffee and biscuits, and offered apologies by Gabby and her colleagues for the delay. Apparently the rehearsals for The Wurzels' musical bit were taking longer than anticipated. Funny, we thought - they've been playing it nearly every night for the last twenty-five years - they can probably play it in their sleep by now! After another quarter of an hour or so, we were at last led downstairs to the studio where the lads were waiting for the recording to start. I was pleased to get a wave of recognition from them as I sat down in the front row. From where we sat we could see the whole set, laid out to represent the various rooms of the "house". The floor of Gloria's "living room" had been strewn with straw and hay bales to make the boys feel at home! Although using a bit of technological trickery, it was still a great performance to watch, with the boys movin' and groovin' like good 'uns, and we didn't need any prompting to applaud enthusiastically at the end. However, the director apparently wasn't satisfied with the performance and another take was ordered. For some reason this was abandoned half way through - although most of us couldn't tell any difference from the first one. We were asked to clap along with the third take, and apparently this made all the difference - it was in the bag, or pot, or pan, or can or whatever they call it! While the rest of the audience were taken off to a room full of booze somewhere, I shook hands with the lads and we then went up to The Wurzels' changing room. On the way up we met the first lady of TV herself coming down for her own rehearsals - she graciously shook my hand and said hello although she didn't have a clue who I was! Back in the dressing room, after a bit of a chat, Dave and John (who were taking no further part in the show) said goodbye and headed off to catch the football on TV. Pete and Tommy then had to wait a while to be summoned back down to record their interview with Gloria, which gave me a good chance to catch up with the news and get a few more answers to questions I'd been saving up to ask. Pete in particular was in high spirits and obviously enjoying himself - he said he'd found singing the "cowshed remix" version of the song a bit more tiring than usual, bearing in mind that he was having to sing it at about twice the speed of the usual version. As ever, Pete and Tommy were both great fun to talk to and made me feel most welcome - not only are they great entertainers, but you couldn't meet four nicer guys than the current band. While we were waiting, Tommy and Pete were fitted with their radio mics ready for the show. We had to be careful what we said after that, just in case! Back downstairs on set, I was allowed to take a couple of photos of the lads in Gloria's "house" while the floor manager spent a few seconds explaining to them what he wanted them to do. In honour of the boys' visit, Gloria's usual comfortable interview chairs were replaced by the straw bales much preferred at home by the lads - a thoughtful touch. Even Gloria risked her posh frock by sitting on one, to the consternation of the costumes manager! Before the start of the main show recording, Gloria stood in front of the (by now considerably larger) audience and told us a joke (using me, for some reason, as a sort of prop! ), and then Steve the warm-up man encouraged us to clap and cheer as the show started. Gloria brandished a Wurzel stick as a clue to the first guests, announcing that we were in for some Scrumpy & Western music, and then sat down on her interview bale and introduced the boys as they were ushered in through the "front door". Greg the researcher had done his job well - naturally, since he had used the Wurzelmania! website as his prime source of reference! Gloria's questions covered the early days with Adge Cutler (with my record cover picture shown on screen!) and the 1970s heyday of the later Wurzels. She also made mention of the Farm Aid connection. Tommy and Pete were good entertainment value as usual. During the interview, a couple of clips of the 1970s hits I Am A Cider Drinker and the original version of Combine Harvester were shown as a reminder to those who might have forgotten what they were like. And for good measure Pete gave a demonstration of some of the many (legal!) uses of a Wurzel stick! It was an interesting and entertaining interview for Wurzels' fans and Gloria's knowledge of Scrumpy & Western music was (more or less!) faultless, thanks to Greg's thorough research. As we applauded at the end of the interview, Pete and Tommy were led over to Gloria's "kitchen" where the resident cookery presenter Anne Stirk had come up with a couple of scrumpy-based recipes in honour of the lads' visit. Anne worked them hard at stirring the dishes and beating eggs. A gallon jar of Westons' scrumpy was on hand, a small quantity of which was used in the cookery, and a bit more was consumed by Tommy and Pete - after all, cookery can be thirsty work! Pete had to go easy as he was driving later, but for the audience's benefit he demonstrated the proper Somerset way to drink out of a gallon jar. The results of their culinary efforts were judged delicious by the boys - that's yet another talent of theirs we didn't know about! The end of the cookery item was the cue for the first commercial break. In the few seconds available, Gloria kindly let me take a photo of her with the boys, and that was more or less it, as far as the Wurzels were concerned. The rest of the show consisted of interviews with other guests including a couple of women who had trekked to both the South and North poles; TV presenter Alice Beer; and Jill Moss, an expert on dolphins. Then at the end Gloria announced the moment we had all been waiting for - the first ever TV appearance of The Wurzels' latest single - and we were able to watch the completed video of the song we lucky few had seen recorded earlier, on the studio monitor screens. This appeared to go down well with the rest of the audience who were seeing it for the first time, auguring well for the record's future success. Then Tommy & Pete were back on set with the other guests for the finale while the credits rolled. And that's yer lot! Tommy & Pete went off to get changed ready for the long drive back down west, while the floor manager swept away the straw, the camera crew made sure the rest of the scrumpy supplies didn't go to waste, and the happy audience filed out. It was an interesting and enjoyable evening and my thanks are due to Gloria, Greg, Gabby and the rest of the friendly crew for their hospitality and for looking after me so well. And thanks also to Tommy, Pete, Dave and John for being such great blokes for making me welcome too - and for putting on an entertaining show!